December is a month that can become overwhelming and stressful, as we combine year-end business wrap-up with holiday activities, sprinkled with creating gift lists, cooking more than usual, decorating, and tackling overcrowded malls to do our shopping. Whatever way you choose to celebrate the holiday season, it usually involves an over-abundance of additional activities. That’s why we wanted to create a special challenge for the month of December, designed to refocus your thinking and ground you in the power of a Giving Consciousness. 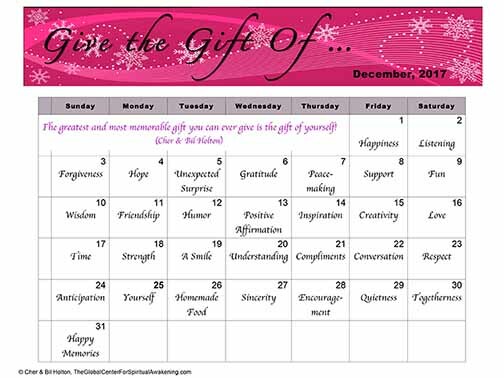 We have created our first annual “Give the Gift of …” 31-day Challenge! Decide what the focus area means to you. Throughout the day, find as many ways as possible to give, based on how you defined the focus area. Your goal is to find a least one opportunity to give for every waking hour of the day! How many different ways did you find to give? What was the most unique? How did this Giving Challenge affect you emotionally? What impact did you notice it having on those around you? What lessons can you take away from this activity that will stay with you as you move forward? Never forget this powerful Truth: The greatest and most powerful gift you can ever give is the gift of yourself! May this be an incredibly enlightening and empowering month of giving, as you walk the spiritual path on practical feet! Read more December-related posts, including MetaSpiritual interpretations of Christmas, here.